You're probably thinking that I have abandoned my poor pink mixer lately. Well I have been trying to eat healthy, but don't worry some sweet treats will be coming soon! Meanwhile, back to my healthy eating plan. Even though I am trying to stay on the healthy track, I do crave something sweet every day. This little snack is perfect for my plan. 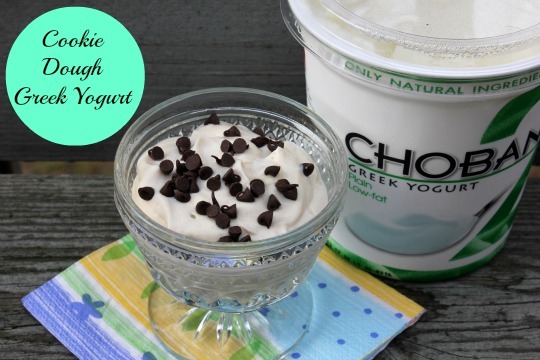 Greek yogurt pimped out to taste like cookie dough. I have a fridge full of 32 ounce containers of greek yogurt that the super nice people from Chobani sent me, so I'll be set for awhile. Combine greek yogurt with the peanut butter, maple syrup, vanilla extract and sea salt. Top with mini chocolate chips. This recipe might get me to eat more yogurt! Yum!